Summary: A high-accuracy (0.1 cent) clip-on tuner! But it’s a Peterson Strobe tuner and that means tuning sweeteners. The StroboClip has several of Peterson’s sweeteners for different instruments, and these sweeteners ensure that your instrument(s) will sound great. Pros: To me, the Sweeteners are what set apart Peterson tuners from the pack. But as far as the StroboClip is concerned, the clip-on is great for use in both the shop and on stage, and the fact that it is a clip-on makes it versatile enough to use on a variety of instruments. And with a metal enclosure, you can be assured of its durability. Tone Bone Score: 5.0 ~ I received this as a test unit from Peterson the other day, and used it to intonate one of my guitars, which I then used for a recording, and used it on-stage this evening. In all applications, it worked incredibly well. I have absolutely no complaints about this unit! So for studio, shop, or stage, this is a winner! I dig Peterson tuners, and the fact that this comes in a clip-on makes it super-versatile; add 0.1 cent accuracy, and this is an absolutely fantastic tuner. I’m not really one to use a clip-on on-stage for guitar, even though I used it tonight to test it out, but for the studio, and especially for intonating guitars, I can see how the StroboClip will be an indispensable tool for me! That said, I am getting a ukulele pretty soon, so I’ll probably be using the StroboClip for that. As I mentioned above, the thing that has always stood out for me about Peterson tuners in general are the sweeteners. I don’t know any of the mathematics behind the technology, but the best explanation I can give is that the Peterson tuners don’t just tune the string to the exact correct pitch. When set to a particular type of sweetener (for guitar and other instruments), certain calculations are made in the tuning algorithm to compensate for the type of instrument. The net result is that once you tune, your chords and note runs sound great! Many tuners that just tune a string to the exact correct pitch, require some adjustment to get them completely dialed in. But with a Peterson strobe tuner, those minute adjustments are already done for you, so when you tune, you tune to the compensated pitch. That’s about the best explanation I can give without the technical knowledge. Just let it be said that once I’ve tuned with a Peterson tuner, my guitars sound so much better because they’ve been tuned with the guitar in mind. But the StroboClip also includes several other sweeteners for other instruments such as mandolin and ukulele, so it can be used to great effect with different instruments. With respect to the physical act of tuning, it takes awhile to get used to tuning with a strobe tuner. Unlike other tuners where you either center a needle or LED, all Peterson strobe tuners use a moving checkerboard that speeds up or slows down depending upon how far off your tuning is. Right to left movement means you’re flat, and the converse for sharp. As a strobe tuner is super-sensitive, you have to get used to picking very lightly (I just use my thumb) to tune. But once you’ve gotten the feel for it, it’s very easy. Tonight, I used it in my weekly solo acoustic gig. Amazingly enough, my Yamaha APX-900 stays in tune so well – never had an acoustic that did that – so the adjustments I made were minute to each string. But I do have to say that after tuning with the StroboClip, unlike other tuners like my venerable TU-2, I didn’t have to do any post-tuning tweaking. As for the price of $70, it’s not cheap. But believe me, if you want a great tuner for studio or shop use, you could do a lot worse. I found it extremely useful for intonating my guitar last night. I have an old Seiko analog-style tuner that I’ve used for years for that purpose, but it has always required running a cable from my guitar. With the StroboClip, I just clipped it to the headstock. This also meant that I could keep my guitar plugged into my amp so I could hear what I was doing as well as see what the StroboClip was doing. So very cool! All in all, this is a great little unit that I will most assuredly be keeping around for a long time! Peterson is at it again. I did a review on the Peterson StroboRack awhile back, and loved the unit, though as a pedal guy, the rack didn’t make much sense in a gig situation. I’ve seen the StroboStomp in operation, and that’s a cool unit. Now, Peterson has just released the new StroboClip, which combines the strobe technology Peterson is known for along with several “Sweeteners” for specific types of musical instruments, and provides 0.1 cent accuracy; all in a clip-on tuner! How cool is THAT! True to Peterson build quality, the StroboClip isn’t made of cheap plastic. It is housed in a metal casing, so it should be quite durable, and the backlit LCD display should help a lot in making the tuning bars readable. If you’re new to Peterson tuners, they use a pattern of left-right moving bars to indicate tuning. Movement left is flat, movement to the right is sharp. Once the bars stop moving, then the instrument is in tune. It takes a little while to get used to, but once you get the hang of tuning with a strobe tuner, it’ll be hard to go back to another type. I had trouble parting with the StroboRack when I had it, but also didn’t want to pay the price of a rackmount unit. With the StroboClip, I might just be enticed to get one – especially for my solo acoustic gigs. My onboard tuner works okay, but it’s not as accurate as I’d like, and I oftentimes have to do some post-tuning tweaks to get it dialed in. 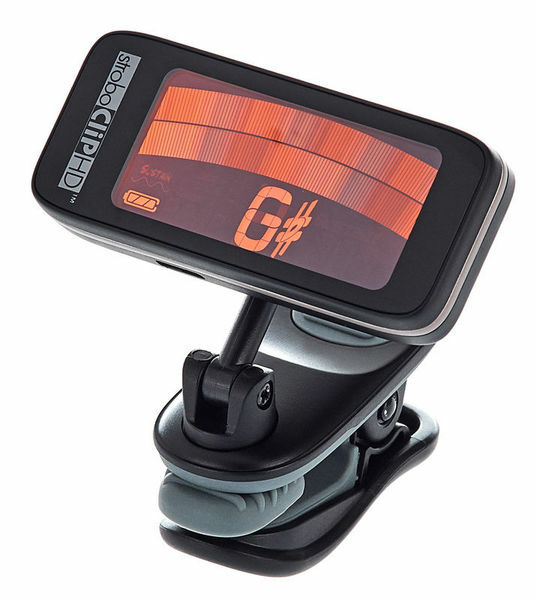 But with a super-accurate tuner like the StroboClip, that might solve that problem. Alsip, Illinois, USA – 8-6-2010 – Peterson Strobe Tuners has added a clip-on style strobe tuner to their Virtual Strobe™ series line-up. The StroboClip™ is designed for acoustic instruments and contains many new features not found in traditional clip-on tuners. The large strobe display maximizes the StroboClip’s screen area by moving the strobe bands horizontally, rather than vertically as in previous strobe tuner models, to guarantee easy viewing in various lighting conditions. New and exclusive Sweetened Tuning® presets for banjo, mandolin, and ukulele offer dedicated settings for players of these instruments to facilitate tuning. A variety of other presets including Dobro®, lap steel, and settings for the violin family come standard in the StroboClip. Settings for eclectic instruments such as lute, bagpipes, and oud are also covered along with additional Eastern Temperament settings for instruments of the like. The StroboClip also features an exclusive Sustain mode™. In Sustain mode, the StroboClip can be set to hold the tuning pattern for a short time after the note has decayed so that instruments with short voices, such as banjo and mandolin, can be tuned quickly and easily. For regular tuning, the Sustain mode feature can be turned off. The StroboClip is encased in a brushed aluminum shell to help it withstand the rigors of the road and the included cushioned, metal carrying case will keep it safe when not in use. Soft, rubber pads in the jaws of the StroboClip protect the instrument’s finish while providing a firm grip for maximum signal conductivity. The MSRP of the StroboClip is $89.99 and it is now shipping. Visit www.petersontuners.com or www.stroboclip.com for more information. Peterson Electro-Musical Products, Inc. has been manufacturing strobe tuners since 1948. 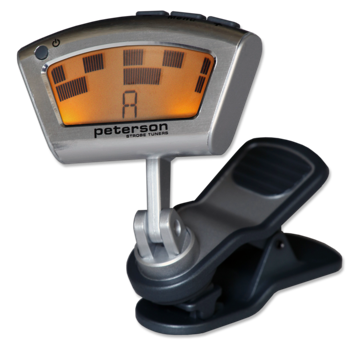 The Virtual Strobe™ series was introduced in 2003 followed by the first ever True Bypass tuner of any kind, the Peterson StroboStomp™ in 2004. The StroboSoft software tuner was released in June 2005.